« Where are the weeks going? This is the hardest post I’ve written so far, and it’s going to be a short one. 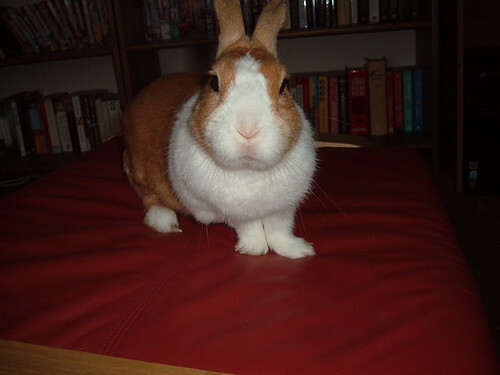 On Thursday evening we had to take our bunny to the vet, for the last time. He was put to sleep. He had been off his food for a couple of days, couldn’t be enticed even by a fresh bag of food, so we took him in on Weds evening to get him checked over. The vet immediately found a large tumour, completely obstructing his bowel. We brought him home, dosed up on painkillers, to say goodbye, before taking him back on Thursday. He was in pain, suffering too much, so I know it was the best (only) thing to do. I promised him I wouldn’t leave him, I’d be there until the very end, and I kept my promise. He died in my arms, with A stroking his nose. I just can’t believe he’s gone for ever. The house is so empty without him, small as he was. I’m probably over-reacting, he was only a pet after all, but I’m devastated. Everything I look at, everything I do reminds me he isn’t here any more. This entry was posted on February 20, 2010 at 12:01 pm and is filed under Rabbit. You can follow any responses to this entry through the RSS 2.0 feed. You can leave a response, or trackback from your own site. Pets become a huge part of our lives, and you needn’t feel that you should minimise their loss. I felt as if I’d lost a close member of the family when my dog died twelve years ago, and I’ve not been able to have another pet since. I agree. For us, any animal that sleeps inside the house is our family and we are just as attached to them as to each human being. I have no idea how we’ll handle it when our first pet goes, but I hope to honor him. I’m so sorry. It must be one of the hardest things in the world to do. You aren’t over-reacting at all.